Built in the second half of the XVI century, at the time of the first expansion of the monastery of Classe within the city walls, the Sala Dantesca was originally a refectory serving the Camaldolese convent. It was named after Dante to celebrate the 600th anniversary of the Poet’s death, in 1921, when it started to be used for the Lecturae Dantis cycles. The refectory and its rich decoration were commissioned by Abbott Pietro Bagnoli from Bagnacavallo, the longtime head of the abbey. 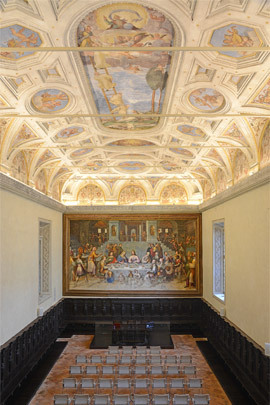 A large fresco by celebrated painter Luca Longhi portraying the Wedding of Cana was added to northern wall in 1580. Another fresco adorns the ceiling with the Dream of St. Romuald. Lining the walls are the exquisite wooden stalls carved by Marco Peruzzi in 1581, decorated with anthropomorphic herms. March 2017 saw the conclusion of lengthy restoration works funded by the Fondazione Cassa di Risparmio di Ravenna and the Emilia-Romagna Region, who brought the atrium and the hall back to their former splendour, to be enjoyed as a highly symbolic public hall for all sorts of cultural events.